The Bakersfield Police Department, which has had three officer-involved shootings in 2018, explains the process for investigating when one of their officers is involved. In 2018, Bakersfield Police Department officers have had in three officer-involved shootings. Following an officer-involved shooting, an investigation is launched. Sergeant Ryan Kroeker said a typical call for service can turn violent very quickly and officers have to make split second decisions. "All of the sudden, things are very quiet and peaceful, the next thing is it's very serious and very violent and people's lives are at stake. Sometimes officers, sometimes citizens," said Kroeker. The internal investigation is two-part. Homicide detectives are called out and internal affairs or I.A. is notified. They each conduct their own investigation. "The detectives assigned to the investigations division are basically investigating whether or not any law violations occurred." Kroeker said. "The administrative side, composed of I.A. detectives, they're trying to determine whether or not the shots fired were within department policy." The investigation can take weeks or months depending on how elaborate a scene is or how many officers were involved. Once the investigation is complete, I.A. detectives present all of the facts and findings to the Critical Incident Review Board. Details of the investigation include the officer's name, how long they've been with the department, any previous officer-involved shootings and more. Officials said the presentation can include crime scene images, aerial images, PowerPoint presentations, radio traffic, and officer and witness statements. "There's information that could be out there but the only information they can decide on is what information the officer had at the time the trigger was pulled. Nothing that comes afterward matters," said Chief Lyle Martin. The Critical Incident Review Board is made up of six, top-ranking officers: the East and West Captains, Support Services Captain, Investigations Captain and the two assistant chiefs. They rule on all critical incidents in the department. Once the presentation is completed, the review board considers all factors of the shooting to determine if it was within federal, state and department guidelines. According to officials, the police department's guidelines are the most narrow, state guidelines are more broad and federal guidelines are the most broad. "Was the force reasonably objective under the totality of the circumstance?" Kroeker said. "That's the criteria for if officers used force appropriately." Kroeker said every round has to be justified. "Some shots can be within policy, and some can be outside policy," he said. The board has to be unanimous in their decision. Once they are, they make a recommendation to the chief about whether or not it was within federal, state and department guidelines. Then the chief makes the final determination. "The rules are what the rules are. These are the guidelines. If you're outside of them, then let the chips fall where they may." said Martin. From January 1, 2015 to August 26, 2018, the Bakersfield Police Department has had 23 officer-involved shootings. Three of those in 2018. Twenty of those shootings were ruled within federal, state and department policy, three remain under investigation. In the history of BPD, three officer-involved shootings have been ruled outside of department policy. They happened in 1998, 2004, and 2006. The practice of BPD making decisions on critical incidents involving their own officers has been criticized over the years. But Martin says he's not out to try to change people's minds about the process. "If you've got you're mind made up, it doesn't matter what I tell you, It doesn't matter who looks at it. You can see other agencies across the country that have been looked at by DOJ the FBI -- and the folks that say it's not justified, it doesn't matter who reviews it. It's still not justified." said Martin. He says he and the department do everything in their power to ensure the review process is fair. "It's critical that we get it right and you know I'm not going to sit here and jeopardize my reputation, my career, my credibility within my community for anybody." said Martin. 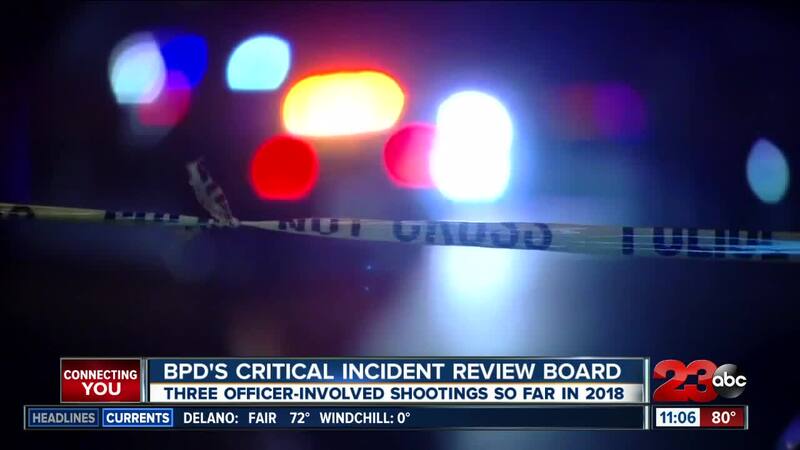 23ABC asked to see examples of information shown to the Critical Incident Review Board in past reviews, but we were told because of the Officer's Bill of Rights, that is not available to the public. To see a full copy of the Bakersfield Police Department's "Use of Force Policy" is below.